We rolled into Tucson three weeks into January to begin a month-long “residency.” Staying put in one place for a month is an experiment of sorts, in part a product of our 2019 goal of traveling more slowly. It’s an opportunity to get to know a place in greater depth, instead of focusing all our efforts on one national park or similar destination. Also, it’s a perfect place to weather the coldest time of the year. I am not complaining about wearing sunscreen and T-shirts every day when most of the country is struggling with frigid temperatures. Outdoors – Desert hiking to our heart’s content surrounds us. Science – Great stuff ranging from cutting edge astronomy to science history. History and Culture – Tucson has been occupied by humans for 4,000+ years, from ancient cultures to native peoples to Spanish missionaries. There’s a whole lot of history here. Community Engagement – Being in one place means having more than a passing acquaintance with the community. 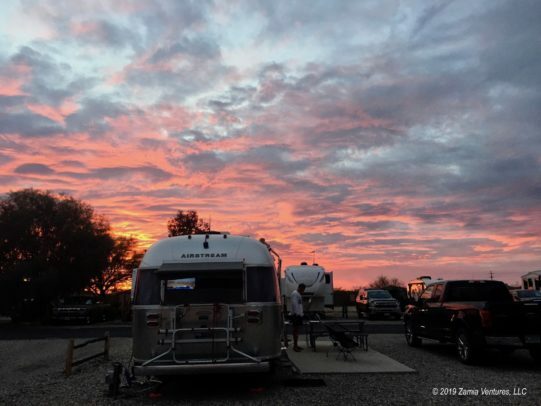 Since we are staying at a private RV park with full hookups, we also have the chance to perform some routine maintenance on the trailer, such as flushing out all our tanks and sanitizing our water lines. It even means we can eat a little differently — we are not as constrained by water consumption, so we can indulge in meals that include our beloved pasta or that require extra cleanup (baked casseroles, for example). So how did we do during our first ten days in Tucson? Pretty spectacular, I’d say. Tucson sits on a flat plain, surrounded by ranges of mountains, in the midst of the Sonoran Desert. The desert environment is distinctive, and I am still captivated by photographing the strangely beautiful plants and animals that populate this ecosystem. The mountains surrounding Tucson are both visually dramatic and a great location for outdoor activities of all sorts. It’s very easy to enjoy the outdoors here, at least during the mild winter months. 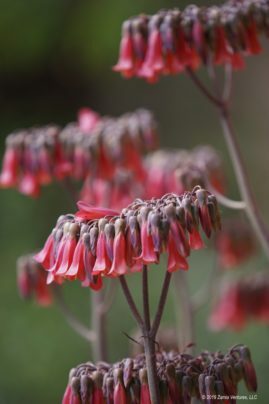 As usual, we took advantage of our membership in our home botanical garden to visit the local botanical garden for free through the reciprocal admissions program. Tohono Chul is fairly large, at almost 50 acres, and is an urban garden located along a busy roadway. The garden has a nice combination of formal demonstration gardens and more natural desert hiking areas. 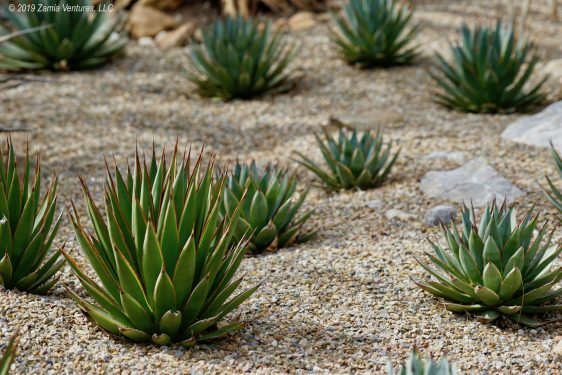 The variety in the collection is obviously limited to plants that can survive in this harsh desert environment, but the garden planners were pretty creative within this major constraint. I was very amused to see an eastern plant that I consider a huge pest, Virginia Creeper, presented as an option for creating a vine-covered pergola or wall. Apparently those suckers are tenacious enough to live in the desert with a little irrigation, which doesn’t surprise me in the least. 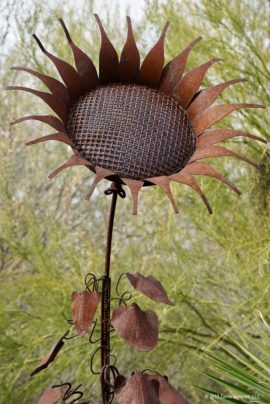 Metal sculptures placed throughout the gardens added a lot of visual interest to a landscape dominated by cactus and agave species. Identification signage was plentiful, so we were able to learn the names of many different species that we’ve been seeing during our time in Arizona. The garden was a pleasant little oasis in the city and a wonderful place to spend an afternoon, where of course I took way too many botanical photos. 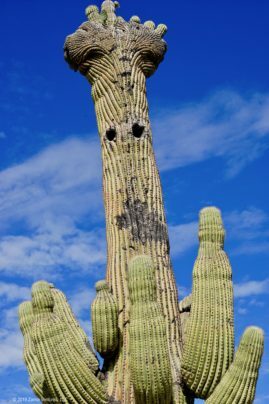 The Arizona Sonora Desert Museum deserves its reputation as one of the very best destinations in Tucson, even though the term “museum” really doesn’t capture the breadth of this facility. 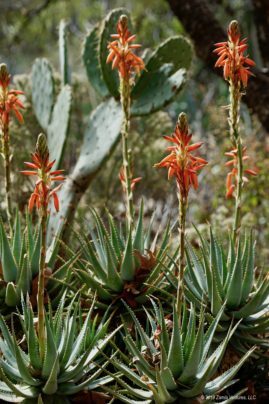 Part botanical garden, part zoo, part natural history museum, and part art/culture institute, the ASDM is focused exclusively on the flora, fauna, and people of the Sonoran Desert. We are not normally big on zoos, since we don’t really love animals in captivity, and seeing animals far outside their home territory is just weird. I mean, is there anything sadder than a polar bear sweating in San Diego or a toucan shivering in Chicago? Because the ASDM only holds animals that are native to the Sonoran Desert (except for a sting ray touch tank which…. I just can’t explain) the animals live in natural-looking outdoor environments, often with nothing but thin chicken wire keeping them enclosed. We really enjoyed watching the inhabitants engaging in their typical activities in a relaxed setting. I should point out that the name of the show is a bit of a misnomer, since not all the birds are raptors or true birds of prey. Our first free-flying bird was a Chihuahuan raven, which is more of a scavenger than a hunter. However, like all corvids the ravens are incredibly smart and probably quite fun (or completely maddening) to train. During our first visit we were treated to an extended discussion from one of the trainers about the training techniques they use (positive reinforcement only) and some of the mishaps the ASDM has encountered along the way. 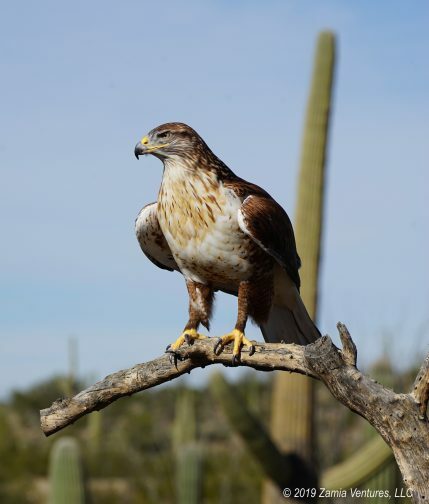 Their resident red-tailed hawk regularly leaves the immediate area to patrol “her territory,” has stayed out for as long as 25 hours before returning home, and was bitten by a rattlesnake in the course of a hunt. This gal is obviously tough! 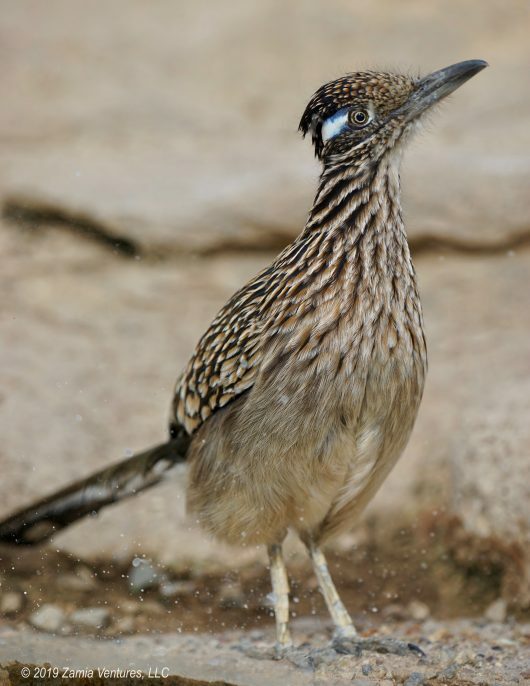 Some of the other bird highlights included two separate walk-in aviaries: one for larger birds and one focused on hummingbirds. The hummingbird aviary in particular was a good place to illustrate just how much help I need with bird identification. I mean, there is a limited number of species living in the aviary, and I was still hard-pressed to figure out what I was looking at most of the time. Fortunately we will have plenty of time to improve our skills on subsequent visits. Maybe a female Costa’s hummingbird? Last but not least, the Desert Museum has excellent collections of cacti, agaves, and pollinator-attracting wildflowers, where I naturally spent a lot of time. 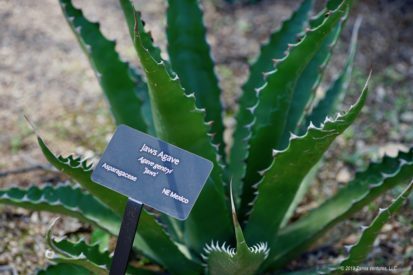 The information about the different species was excellent, and the materials describing the historical methods of agave cultivation were fascinating. I just find the sculptural qualities of succulents to be incredibly compelling. 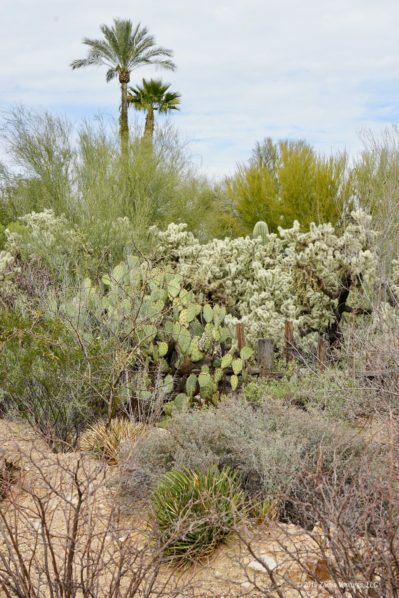 Spending time in the beautiful but spiky gardens of Tohono Chul and the ASDM has convinced me that if we lived in this area I would need to invest in some chain mail in order to garden comfortably! 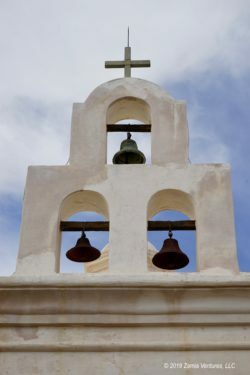 Our RV park is located a stone’s throw from this iconic mission church, which is still a functional and very active parish church, so of course we were sure to visit. The building dates from 1783 and is the oldest European structure in Arizona. The Baroque style is particularly evident in the elaborate main facade and in the beautifully restored interior. 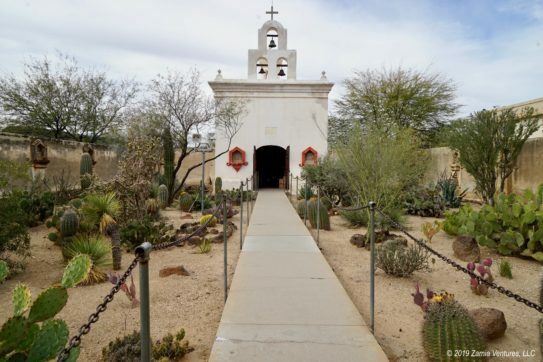 Despite being located at the far northern end of the range of Sonoran Desert mission churches, far from centers of population and artistic workshops, the church is just bursting with decorative elements. 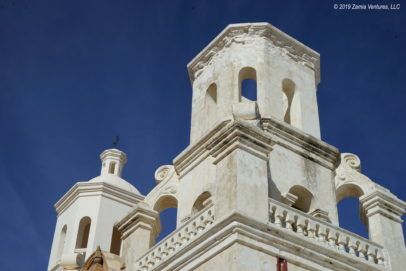 The white-washed exterior highlights the difference between the fully restored west tower (on the left above) and the east tower that will be restored next. The beautifully restored interior of the church is filled with sculptures, with intensely detailed decorative paintings on all the walls and ceilings. We enjoyed a free walking tour of the mission complex, which included both the church and the administrative areas of the mission. 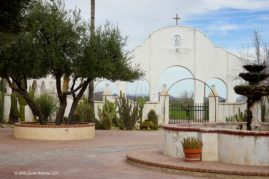 The interior courtyard of the mission is a cool and peaceful spot, punctuated by olive trees and fountains, while the thick-walled chapter house and other rooms hold various artifacts and displays. The ceilings of the mission are made with huge main timbers, with “lath” made from saguaro cactus skeletons placed across the main beams. Most of the sculptures were made in workshops in Mexico (then called New Spain) and arrived via oxcart after a months-long trip, but the main construction materials were fabricated onsite by the Tohono O’odham people who made up the bulk of the congregation. 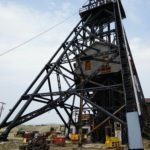 The builders lacked access to most of the materials common in medieval European churches, so there are no marble columns or mosaics of gold and precious stones. Still, the church appears to be just as elaborate and impressive as many of its European peers, thanks to clever use of trompe l’oeil painting techniques to create the appearance of marble and other materials. 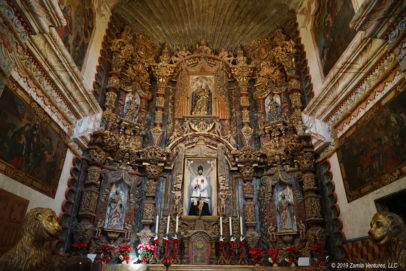 Those looking for a genuine medieval European church experience would probably find San Xavier a satisfying substitute. Looking for walls covered in Madonna-and-child paintings in which the Baby Jesus has the face of a haggard old man? Check! How about a life-sized, fully-clothed doll representation of a saint that visitors kiss and caress hoping for divine intervention with personal issues? Check! Saint’s medals, candles, and other objects shamelessly hawked to supplicants seeking to placate an angry God? Check! While the mission was beautiful and quite interesting, it was creepily reminiscent of scores of medieval sites we’ve visited in Europe. Also, it is still a functioning diocese with a significant community of priests and nuns operating the church and school and therefore very much part of the Catholic Church. Not surprisingly, there was no discussion at all about the less savory aspects of the Spanish mission system. 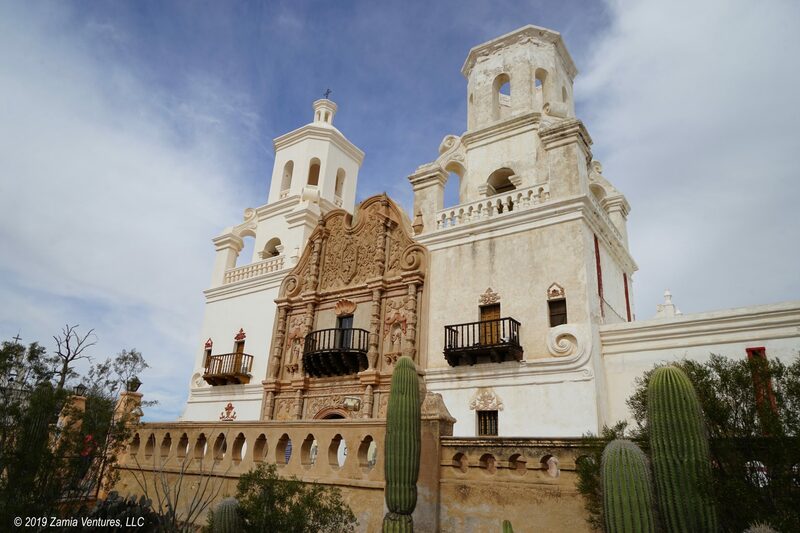 I’m looking forward to getting a different perspective by visiting one of the nearby missions that is now a national monument in order to get a more balanced and scholarly presentation of the history and purpose of the missions. The final highlight of the first part of our Tucson stay was a large amount of human interaction. Meetups with other RVers continued at a furious pace. We are staying at the same RV park as the Roving Rings (Hilary and Barbara, who Instagram at @roving_rings), so of course we have had plenty of opportunity for getting to know them. We also met up with Kevin and Laura of Chapter 3 Travels to share excellent Mexican food and travel stories. It has been a real treat to finally have in-person interactions with so many people that we have followed online for months and even years. We don’t completely understand why we had to wear hard hats to paint. Our other major form of community engagement was a day of volunteering at Habitat for Humanity. There is a large build site just a few miles from our campground, and spending a day volunteering was an excellent way to see a non-touristy part of Tucson. We met quite a few other locals — mostly retired professionals — who keep busy as regular volunteers with this worthwhile organization. Unlike other Habitat sites that I have volunteered at, these homes were nearly done and the tasks involved finish work in anticipation of upcoming closings. 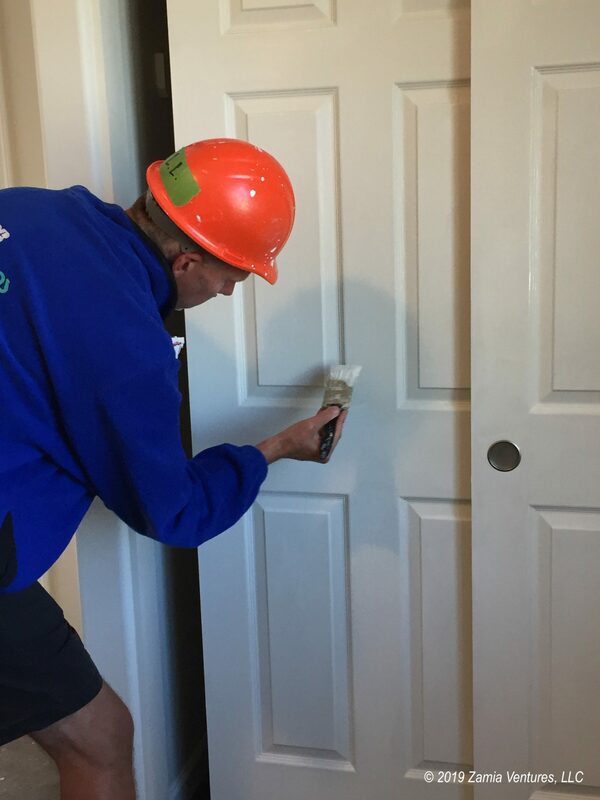 As newbies, we were handed paint brushes and told to get to work on painting all the interior doors. I hope the residents of this lovingly-built home appreciate the weird positions we had to get into in order to paint the interiors and hard-to-reach edges of all the doors! There will be more Habitat volunteering in our future, and this was a great introduction to the local chapter. After nearly a year filled with many solitary hikes and limited social interaction, it’s been a pretty significant change to have such a busy social calendar, and it looks like the excitement will continue for the duration of our stay. 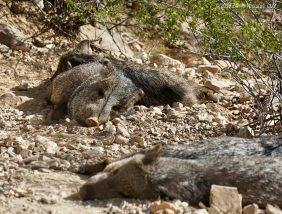 We’ve only just begun to scratch the surface of all the Tucson offers, and next week we’ll have some hard-core science experiences. So cool that you even fit in time for a day of volunteering with Habitat for Humanity. (2/6 to 2/10). The town is a small, very active artists’ mecca. 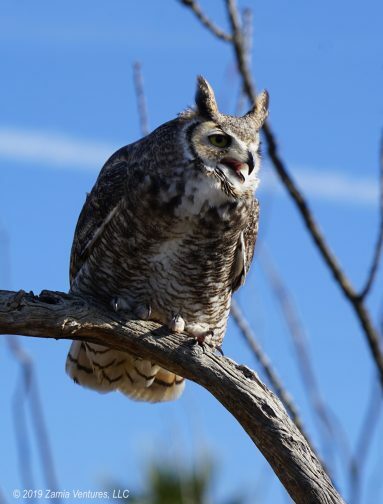 Check out The Tubac Golf Resort – very interesting history & worth a look around. Elvira’s restaurant was also a fun spot. Thanks for the tips! 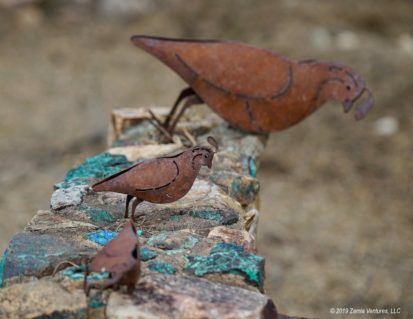 We did swing through Tubac on our way to the Tumacacori ruins this week, and if we have time we will check out the art festival.